It’s perfect weather out there for the snow peas that I have sown – sunshine interspersed with light rain. Inside, I have started a few vegetable seedlings to be transplanted to the garden when the soil gets warmer. Discovering that a seedling has pushed its way out of the soil overnight always brings me great joy and elicits a “Wow!” from me.. Shown in the picture here are two 黃瓜 (huángguā) seedlings. How would you say 黃瓜 (huángguā) in English? Literally, it translates to “yellow squash”. However, yellow squashes are not what I expect to harvest from these plants when they mature. Rather, 黃瓜 (huángguā) in Chinese refers to what you call cucumbers in English. Recently I finished writing a mig-grade novel (for ages 11 and up) titled “The Little Monk”. Not to leave out the Chinese-speaking readers, I have translated the story into Chinese as well, with the title “小和尚 “. I hope to get these two books published by the end of this year. Anyhow, what I want to talk about today is language translation between English and Chinese. At first, hoping to save time with the translation, I ran the text through an English-Chinese online translator. The result was totally unreadable and not even worth editing, but it did give me many a good laugh. I thought I’d share a few hilarious examples with you. In the above example, the auxiliary verb “may” was interpreted as the fifth month of the year. In the above example, the word “palms” was interpreted as the palm leaves instead of the palms of the hands. He lifted his wooden staff. In the above example, “staff” was interpreted as the employees instead of a long stick. Here, “club” was interpreted as an organization instead of a cudgel. See? When an English word has more than one meaning, it usually messes up the translation. Same with the following example. Question: Why are rivers rich? The answer: Each river has two banks. The above example makes me think that the translator must be a baseball fan. In the following two examples, the translator seems to be business-minded. As you can see, the problem with many translation software programs is the lack of artificial intelligence. Verbatim translation does not work well, as many English and Chinese words have multiple meanings, and the sentence structures of these two languages are quite different. How to do a good job with English to Chinese translation, or vice versa? You will first need to correctly interpret and understand the content in the source language. Then, you can put the other hat on and express the same meaning and sentiments in the destination language. It is all right to use different words and expressions in the translation as long as the idea is correctly communicated. For example, for “not worth a fig”, don’t mention figs at all, as the Chinese do not associate figs with worthless things. Instead, simply say “一文不值 (yī wén bù zhí)”, which means not worth a penny, or worthless. Speaking of Chinese sentence structures, please review Chapters 19 and 25 in “Learn Chinese through Songs and Rhymes“. Everything will be as you wish. Everything will be very auspicious. A sow is called 母猪 (mǔzhū), and a hog is called 公猪 (gōngzhū). If you know that 公主 (gōngzhǔ) is a princess, you will definitely understand why it is important to speak Chinese using the correct intonation. The wild boar is called 野豬 (yězhū). In the popular children’s story “Three Little Pigs”, or 三只小猪 (Sān zhī xiǎo zhū), two of the pigs are dumb and lazy, while the youngest one is intelligent and hardworking. In the Chinese novel “Journey to the West”, or 西游记 (Xīyóujì), the monk’s second disciple 猪八戒 (Zhū Bājiè) is also depicted with faults and strengths, albeit more of the former traits than the latter. In Episode 23 of the Journey to the West by Little Fox, you can see how 猪八戒 (Zhū Bājiè) was fooled into carrying all the luggage for the journeying party, how he shirked the work and wanted to eat all the time. 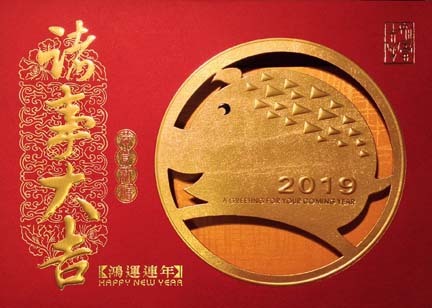 Generally speaking, most Chinese consider pigs 肮脏 (āngzāng filthy), 愚蠢 (yúchǔn stupid), 贪吃 (tān chī gluttonous) and 鲁莽 (lǔmǎng crude and rash). This is clearly reflected in many idioms involving the pig. The pigs and the sheep have discolored. Worse than pigs and dogs. Pigs dash forward and wolves flee. 豕 (shǐ) is the formal word for pigs. One is a dragon, and the other is a pig. Pigs fashioned from mud, dogs made from clay. Point the finger at the pig to chastise the dog. Having a pig’s head and brains. Using cold water to scald a pig. Rén pà chūmíng, zhū pà féi. Rrén bùzhī ér bù yùn. Even if no one takes note of them, they don’t mind. The other day an old song popped into my mind, and I was able to recall two stanzas of the verses. Those I have translated into Chinese, and I am pleased to share them here with you. This German folk song is called “Die Gedanken Sind Frei”, which means “Thoughts are free”. The powerful lines in this song remind me of “Invictus”, a poem written by the British poet William Earnest Henley. To download the piano sheet music for this song, click on the “Music Sheets” tab at the top. One’s thoughts are truly free. Yǒu shéi néng jiàng tā cāi tòu? Who is able to guess them? xiàng lüè yǐng sìchù yóu zǒu. One’s thoughts are truly free! As you may have noticed, I have included many four-character Chinese idioms and expressions in the above lines. There are many advantages of using four-character Chinese idioms, espcially in poems and lyrics. They are concise word nuggets that pack a powerful punch in them. Some idioms make a long story short, and many will elicit a knowing knod or smile from the audience. 自由自在 (zìyóuzìzài) means being unrestrained and carefree. 四处游走 (sìchù yóu zǒu) is to wander all about. 无从捉摸 (wúcóng zhuōmō) means no way to fathom or ascertain. 白费心机 (báifèi xīnjī) is to bother one’s head for nothing; in other words, to scheme in vain. 多此一举 (duōcǐyījǔ) means to make take an unnecessary action. 毫无意义 (háowú yìyì) means totally meaningless. 铜墙铁壁 (tóngqiángtiěbì) are copper and iron walls. They represent an unassailable fortress. 冲出重围 (chōng chū chóngwéi) is to fight one’s way out. Please also review Chapter 28 of “Learn Chinese through Songs and Rhymes” – Chinese Idioms. by likeabridge in General Q&A Tags: Chinese expression for in the world, Chinese word for a pond, Chinese word for catching a cold, Chinese word for colors, Chinese word for worry, How to say eat in Chinese, how to say I wish or I hope in Chinese, How to say last year in Chinese, How to say new in Chinese, How to say remember in Chinese, How to say take care in Chinese, Learn Chinese word for chubby, Learn Chinese word for flowers, Learn Chinese word for lotus, What's the Chinese word for tall? nǐmen gāng chuān xīn mián páo. You had just donned your new gown. Nǐmen biàn pàng yòu biàn gāo! How stout and tall you have grown! 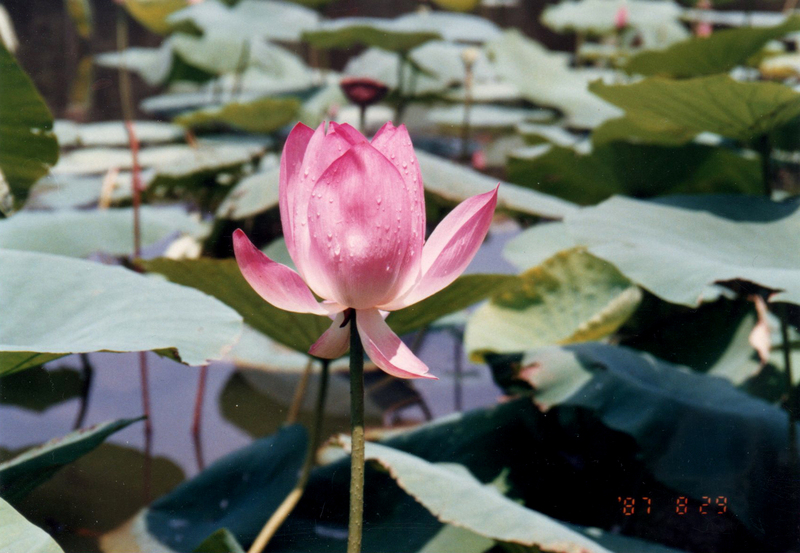 The lotus in the pond formed pods? For I shall tint the leaves with red. As you may know, west winds are associated with fair weather. Therefore, you would expect kind words from the west wind. 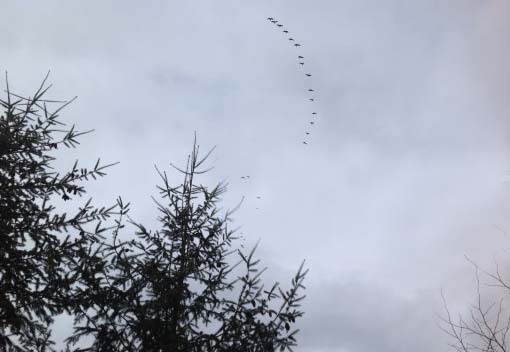 In fact, you can tell that the west wind is talking to a bunch of children. 新 (xīn) means new, and 棉袍 (mián páo) are quilted cotton gowns or jackets. Before winter arrives, parents usually give their children new jackets to wear to keep them warm. The big give-away is on the forth line. Only children and youth can keep growing big and tall. 变 (biàn) means to change or to become. 胖 (pàng) means plump, chubby or stout, and 高 (gāo) means tall. 又 (yòu) means again or also. 不愁 (bù chóu) means need not worry about something. Wǒ xīwàng shìjièshàng suǒyǒu de rén dōu bù chóu chī bù chóu chuān. I hope all the people in the world won’t have to worry about want of food or clothing. There are fewer flowers in autumn than in spring, but we need not worry about lack of colors. The west wind will color the leaves red for us. Here the word 染(rǎn) means to dye. This word also means to contaminate, to acquire a bad habit or to catch a disease. Dāngxīn bùyào bèi chuánrǎn dào gǎnmào. 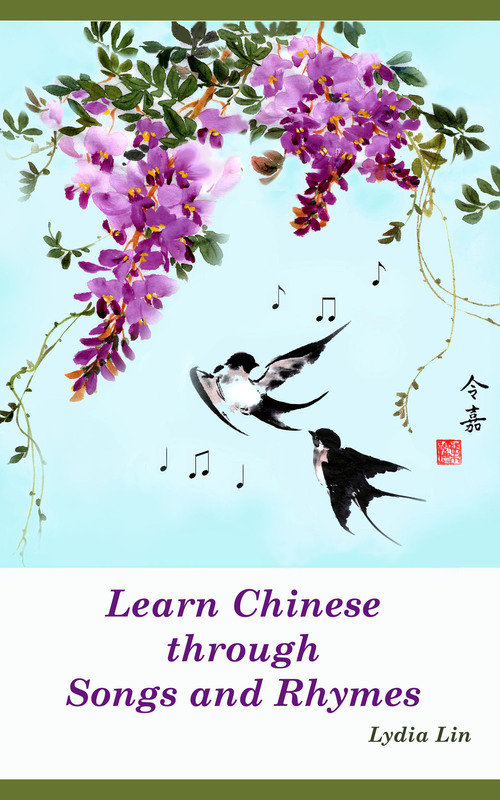 Please see Chapter 23 of “Learn Chinese through Songs and Rhymes” for additional words, expressions and songs related to the four seasons. 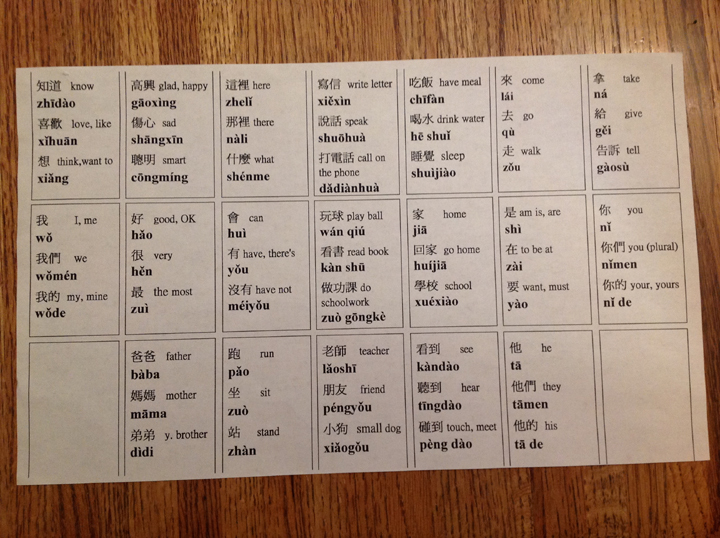 Some time ago I made a board game as a fun way to help with recognizing and remembering Chinese characters. It is fashioned after the game called “Sequence for Kids”. 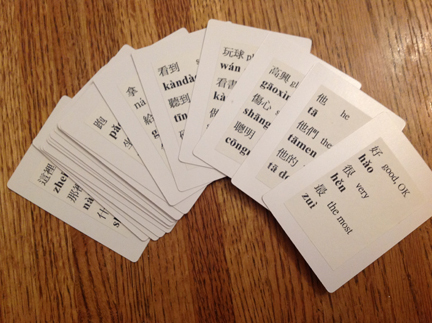 Instead of cards showing different animals, this “Chinese Sequence” uses cards showing Chinese characters or words. It is best played by two people, such as a teacher and a student, or two students who have become familiar with the game. I bought blank cards the size of poker cards, printed the Chinese words on large labels, then affixed the labels onto the blank cards. You will need two identical sets of cards, with 19 cards in each set. The same set of words are printed on two sheets of ledger paper that are joined together to serve as the game board. One half of the game board is pictured here. As the players will be sitting face-to-face across the game board, the two sheets will be joined and positioned such that the Chinese words can be read right-side-up by each player. Unlike Sequence for Kids, I don’t use wild cards. However, the board does provide a free space at each corner. You can use the pieces that come with Sequence for Kids or some other board game, or collect two different colors of plastic bread bag clips (bread tags), 19 pieces each. The pictures here show the Chinese words with their pinyin annotations. You could omit the pinyin to make the game more challenging. Let’s call the players A and B. They are encouraged to speak only Chinese during the game. Each player chooses the color of the playing pieces and collects his/her pieces in one pile. The players shuffle their own deck of cards then draw the top three cards. If Player A sees a word on the board that matches the first word on one of his/her cards, Player A lays that card aside and places one of his/her pieces on the spot of the board showing that word. Player A draws a new card. Player B gets the turn to do likewise. The goal of the game is to get four pieces lined up consecutively in a straight row, column or diagonal. A blank space can be counted as part of the sequence. The player would usually try to take advantage of it when feasible. There is strategy involved. Sometimes it is more advantageous to block the progress of the other player’s sequence than to build up your own sequence. The first person to make the sequence wins the game, and he/she receives one point. The players could agree on a set number of games to play over a period of time. Whoever gets the most points is the final winner. After the players have familiarized themselves with the first word on the cards, then they will switch to playing the game by matching and calling out the second word on the card with the board. When they have learned all the 57 words, you could make new cards a new boards for them to use. Another fun way to use the word cards is to give each player 5 or 6 cards and encourage them to make a simple sentence out of the hand. The player gets one point for each card used in the sentence. Those cards are laid aside, and replacement cards drawn. Please give me a card. Qǐng gěi wǒ yīzhāng pái. Lún dào wǒ le . Wǒ de pái shì . . . Your card is . . .
Zhè yī pán wǒ yíng le. Zhè yī pán nǐ shū le. My heart is filled with joy when I go to the garden to check on my gray zucchini plants. The huge dark-green leaves spreading out from turgid stems and the light-green fruits swelling up under attractive bright yellow-orange blossoms are indeed wondrous to behold, but my main concern is, “Which puppies will be ready to eat in the next couple of days?” Stir-fried young zucchinis are tender and mildly sweet – a delight to the discerning palate. (See recipe for Vegetarian’s Delight in my “Tame Migrain the Delicious Way” ebook.) I carefully remove any extra blossoms from the plant, chop the golden petals up and toss them into the frypan as well. Yummy! 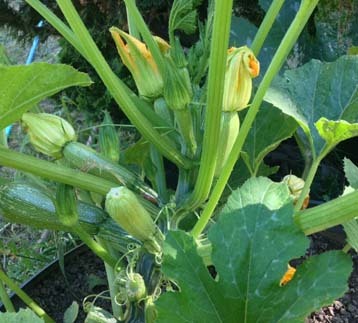 The Chinese call zucchinis 夏南瓜 (xià nánguā summer pumpkins) or 西葫芦 (xīhúlù western gourds). I prefer the latter name because of its interesting ring. The Chinese word for fruits in general is 果实 (guǒshí). Our focus today is on the other meanings of the character 实 (shí), which relate to the fact that a fruit is something solid and tangible, and therefore real and true. When interpreted as a combination of a verb and a nouns, the word 结实 (jiēshi) means to bear fruit. Used as an adjective, 结实 (jiēshi) means sturdy, strong, tough or muscular. 实在 (shízài) means real, true, honest or dependable. As an adverb, it translates to indeed or really. He is an honest and dependable person. Wǒ shízài bù míngbái tā wèishénme líkāi wǒ. I really don’t understand why she left me. Shuō shízài de, wǒ hěn xiǎngniàn tā. Actually (to state the fact), I miss her very much. 实际上 (shíjìshàng) means in reality or as a matter of fact. Shíjìshàng wǒ bù zànchéng tā qù bālí. In fact I don’t approve of his going to Paris. 不切实际 (bùqièshíjì) means unrealistic or impracticable. On the contrary, 脚踏实地 (jiǎotàshídì to have one’s feet planted on solid ground) means to be earnest and down-to-earth. The adjective 真实 (zhēnshí) is used to describe something that is true, real or authentic. 真实的故事 (zhēnshí de gùshi) is a true story. 真实的情况 (zhēnshí de qíngkuàng) is the actual situation or what is actually happening. This is often abbreviated as 实况 (shíkuàng). Therefore 实况转播 (shíkuàng zhuǎnbō) is a live broadcast. Similarly, 实情 (shíqíng) also means the actual situation or the true state of affairs. However, it is usually used to refer to the truth of the matter. The idiom 名符其实 (míngfúqíshí) describes someone who lives up to his or her name. It can be applied to inanimate objects as well. On the other hand, 名不副实 (míngbùfùshí) means unworthy of the name or title. Tiāntáng dǎo shì yīgè míngfúqíshí de dùjiàqū. Paradise Island lives up to its name as a vacation area. 确实 (quèshí) means indeed or truely. Yībān shuō lái, Táiwān de rén quèshí hěn yǒushàn. Generally speaking, the people in Taiwan are indeed quite friendly. Tā shì yīgè huòzhēnjiàshí de shūdāizi. He is a total bookworm. To verify, or 证实 (zhèngshí), a physical law, one could do an experiment, or 实验 (shíyàn). The laboratory is called 实验室 (shíyànshì). To gain hands-on experience, it also helps to do fieldwork, or 实习 (shíxí). 忠实 (zhōngshí) means faithful or loyal, and 诚实 (chéngshí) means to be honest and not tell lies. 老实 (lǎoshi) means frank, honest and well-behaved, often borderin on being simple-minded, naive or gullible. When you want to start a remark by saying “Frankly” or “To be honest”, you could use the expression 老实说 (lǎoshi shuō). Lǎoshi shuō, wǒ duì tā méi xìngqù. To be honest, I’m not interested in him. To end this lesson on a funny note, I would like you to type “Frankly, I don’t give a fig.” into Google Translate and see what it shows for the Chinese translation. Do you know the correct way of saying this in Chinese? I like to read print books as well as ebooks. I also enjoy listening to audio books. It is through written or spoken words that human beings are able to communicate with one another or pass down information and knowledge from generation to generation. Besides, a good book is like a good friend who informs, educates, advises, entertains, comforts and always remains faithful. Therefore, the value of good books cannot be overestimated. The traditional Chinese character for books is 書 (shū) . In the simplified Chinese character system, it is represented by 书 (shū). Books can also be referred to as 书本 (shūběn) or 书籍 (shūjí). 教科书 (jiàokēshū) are textbooks, 参考书 (cānkǎoshū) are reference books and 百科全书 (bǎikēquánshū) is an encyclopedia. 小说 (xiǎoshuō novels) and 闲书 (xiánshū) are for light reading. The general term for books and newspapers is 书报 (shūbào); 书刊 (shūkān) refers to books and periodicals. 书名 (shūmíng) is the title of a book. Zhè shì yī běn yǒuqù de gùshi shū. This is an interesting storybook. You might go to the library 图书馆 (túshūguǎn) to borrow books 借书 (jiè shū). You might place the books on a desk 书桌 (shūzhuō), a bookrack 书柜 (shūguì) or a bookshelf 书架 (shūjià) in your study 书房 (shūfáng), where you might also find a 订书机 (dìngshūjī stapler). Nǐ yǒu méiyǒu zhègè túshūguǎn de jièshūzhèng? Do you have the library card for this library? 书店 (shūdiàn) is a bookstore, and 书摊 (shūtān) is a bookstall or bookstand. On the other hand, 书局 (shūjú) or 出版社 (chūbǎnshè) is a publishing house. A grade-school kid usually carries books in a 书包 (shūbāo satchel) or 背包 (bèibāo backpack) to go to school. 读书 (dúshū) means to study or to attend school. At school they might be asked to commit certain reading material to memory. 背书 (bèishū) is to recite a lesson from memory. In the business world, this word means to place one’s endorsement on a cheque. 看书 (kàn shū) is to read, not just to look at a book. The word 书 (shū) not only refers to books but its meaning also extends to letters and documents. It is also used as a verb (i.e. to write) in classical Chinese. 书信 (shūxìn) and 书简 (shūjiǎn) refers to letters, correspondence or written messages. 手书 (shǒushū) is a personal letter. As a verb, it means to write in one’s own hand. 文书 (wénshū) is a general term for documents. 说明书 (shuōmíngshū) are instruction flyers or pamphlets. 通知书 (tōngzhīshū) are written notices. 上书 (shàngshū) is to submit a written statement to a higher authority. Tā chángcháng xiě qíngshū gěi Ānjí. He often writes love letters to Angie. If he keeps up the effort, he might eventually win her heart and secure a 结婚证书 (jiéhūnzhèngshū marriage certificate). 书写 (shūxiě) means the same as 写 (xiě to write) but is used in a more formal way, sometimes implying the use of Chinese calligraphy. In fact, 书画 (shūhuà) refers to paintings and calligraphy, and the Chinese word for calligraphy is 书法 (shūfǎ). 草书 (cǎoshū) does not mean “grass book”. It is a cursive Chinese writing style that features free flowing strokes that often render the characters unintelligible to the untrained eyes. 书面 (shūmiàn) means “in writing”. So a written permission is called 书面许可 (shūmiànxǔkě). I guess because a secretary shuffles lots of papers, including confidential documents, he or she is called a 秘书 (mìshū). A bookworm is called a 书呆子 (shūdāizi). 书生 (shūshēng) is a young scholar, while 白面书生 (báimiànshūshēng pale-faced scholar) can imply lack of experience and real-world knowledge. shū zhòng zì yǒu yán rú yù. in books there are beauties to be found. 自 (zì) as a noun means self. As an adverb, it means certainly or of course. As a preposition it means from or since. As fiction is the product of an author’s imagination, of course one could find in it fantastic gold mansions and/or out-of-this-world beauties. 颜 (yán) means color. It also refers to one’s face or prestige. A beautiful woman’s complexion is often compared to the color of white jade. Therefore, 如玉 (rú yù) is an expression for complimenting on a woman’s beautiful face. Although it helps to attend a Chinese language instruction class, you can study Chinese on your own if you can get hold of good books and audio material. Many of my readers have found “Learn Chinese through Songs and Rhymes” helpful. I am pleased to announce that this book is now available in ebook format. You can download it from amazon.com or Apple iBooks Store. If you’ve already purchased the printed book from amazon.com and wish to also get the ebook version, you can do so at amazon.com for a discounted MatchBook price. If you have any questions about learning Chinese, feel free to post a comment to any article on this blog site.